Jefferson County ballots were mailed out this week for the Nov. 6 general election. 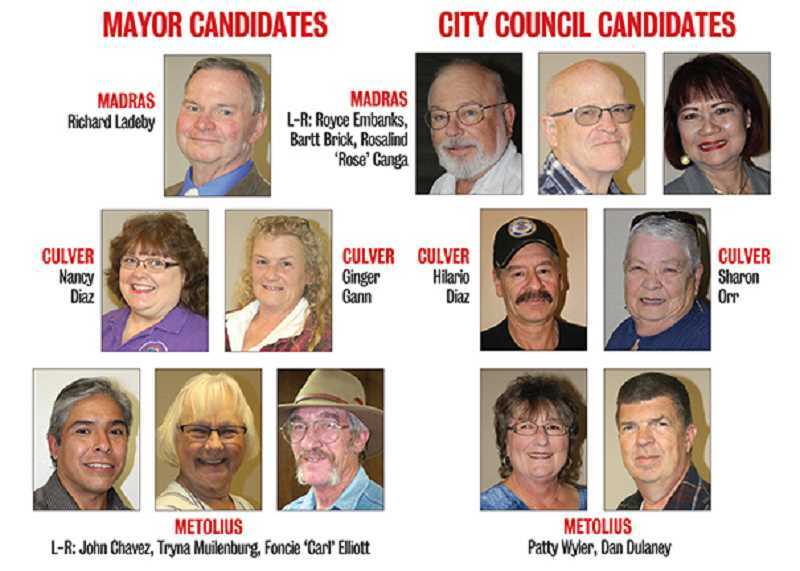 Ballots were mailed out this week for the Nov. 6 election, which includes candidates for mayor and city council for Madras, Culver and Metolius. Each of the county's three communities will vote for mayor and three city council positions. Metolius has a three-way race for mayor, with incumbent John Chavez being challenged by two councilors — Tryna Muilenburg and Foncie "Carl" Elliott. Chavez was elected mayor in 2016, after serving on the council for three years. Both Muilenburg and Elliott have served on the council for eight years. Muilenburg's position ends in 2018, and Elliott's in 2020. Elliott previously served as mayor for four of the eight years. Only two Metolius residents are on the ballot for three council seats: Patty Wyler, who was first appointed in 2011, and elected in 2014, and Dan Dulaney, who has served on the council for the past two years. No one is running for Muilenburg's seat. Culver also has a race for mayor with Ginger Gann challenging incumbent Nancy Diaz, who has served on the council since 2009, and became mayor in 2014. Hilario Diaz has filed to retain position 6, and Shannon Orr, position 2, but no candidate filed for position 1. Madras Mayor Royce Embanks, who has served in that position for the past four years, and prior to that, as councilor since 2003, will step down, and run for a seat on the council. Running for Madras mayor will be Council President Richard Ladeby, who has served on the council since 2011. Running to retain their seats on the Madras City Council are Bartt Brick, who was appointed to his seat in January 2016, and Rosalind "Rose" Canga, who was appointed in October 2017.